I can still remember the first time I played Syndicate. 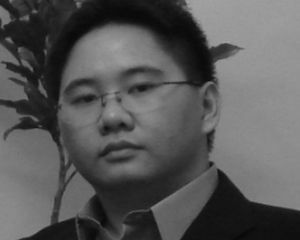 It was after school in late 1993, and I was messing around on an office computer while waiting for my mother to finish a meeting and take me home. I remember the cool mission music, and largely fumbling through the first few missions, my nine-year-old brain not quite grasping the subtleties of controlling multiple characters, much less ones that weren't Mario or Luigi! But the experience stuck with me through the years. I'm mentioning Syndicate now because of its place in my formative years, but the game simply hasn't held up to modern standards. It's more comforting to remember how it nailed its dystopian tone (exemplified by a glorious intro) and made players into a badass cyberpunk CEO. Revisiting Syndicate today reveals a mess of punitive mission design, rudimentary controls, and simplistic mechanics. That discrepancy between reminiscence and reality is important, for playing Satellite Reign more than two decades later feels like how I remember playing Syndicate, which is just about the highest possible praise I can give it. I mentioned the discrepancy between my memory of what Syndicate was and the fact of how it actually played, and Satellite Reign's existence makes that difference all the more apparent. That's because, despite the latter game's obvious tonal and thematic debt to Syndicate, it's a closer cousin, mechanically speaking, to Firaxis' XCOM: Enemy Unknown. 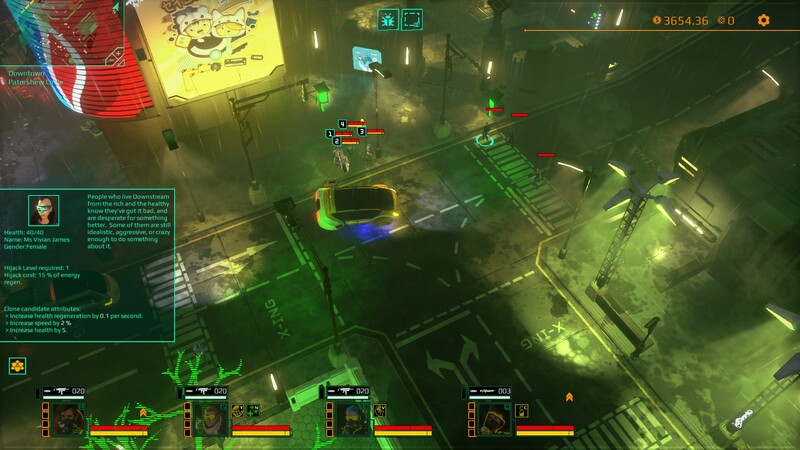 Whereas Syndicate and Syndicate Wars had you controlling a squad of roughly identical agents, each distinguished mainly by the weapons you had them carry, the corporate wetworks team you run in Satellite Reign's consists of four distinct character classes; each class has unique abilities unlocked through the leveling system, as well as individualized ways of dealing with the obstacles in their way. Soldiers can attract and resist enemy fire or hardwire enemy power generators to turn off turrets, doors, and cameras. Hackers can shut down security systems, use drones, and "hijack" enemy and civilian NPCs to puppet as they please, a la Syndicate's Persuadertron. Support agents heal their comrades and can use a "World Scan" ability to trace systems and find suitable hacking targets. Infiltrators can use ziplines, vents, and cloaking devices to sneak past guards while packing powerful melee and sniper attacks. 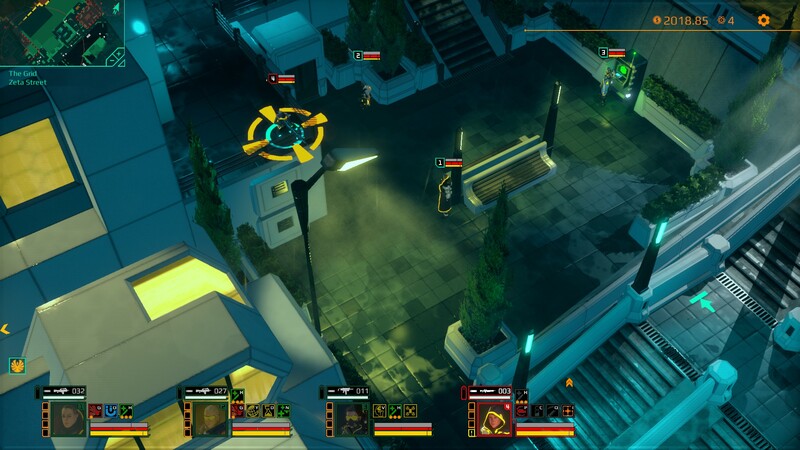 This class system, in addition to the game's requisite suite of cybernetic augmentations, weapons, and equipment, as well as an XCOM-like cover system, makes every encounter and excursion in Satellite Reign a far more involved affair than in its inspiration. Whereas those older encounters usually boiled down to how quickly your guys could mow down theirs, here, every member can work in concert, their abilities complementing each other to lay even the toughest defenses bare. Evasion, subterfuge and pitched combat all have their place, and can happen at virtually any time on the game's open map. That open map is another way 5 Lives stands apart from its peers and inspirations. 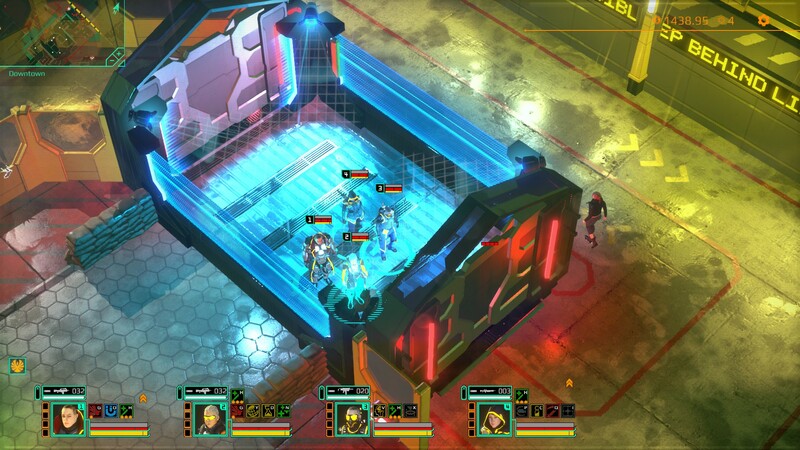 Instead of missions, whether bespoke like in Syndicate or procedurally-generated like in XCOM, Satellite Reign opts for an open-world structure set on what the developers claim is one of the largest maps ever generated for the Unity Engine. The map is that of a city owned and run by Dracogenics, a massive future megacorporation propped up by selling "Res-tech", a cloning technology not unlike that seen in The Sixth Day. Your team, part of a rival corporation, is dropped into the city with an older, pirated version of Res-tech (their explanation for respawning), and tasked with overthrowing Dracogenics' monopoly in the name of business, no matter how much murder and robbery it takes to do so. Everything happens on the map, as your agents claw their way through the city, with nary a loading screen between tasks. Each district, from neon-soaked Downtown to the smog-choked Industrial zone, houses a number of side missions designed to reduce Dracogenics' control. For example, infiltrating the local police station can lengthen the time it takes for guards to call in reinforcements, while planting bugs in a surveillance center keeps security cameras from recognizing your agents too quickly. Breaking into the district bank can increase the speed at which ATMs funnel cash into your coffers. Bribing a disgruntled sanitation worker can unlock a side entrance into a heavily-guarded military base. Locating a conveniently hung power line might give your agents a quick way over the walls, but only if your Soldier can sabotage a nearby generator to keep that line from frying anyone trying to slide down it. It all feels interconnected and detailed in the manner of the best obstacle courses and levels. Through it all your agents will be getting their hands on new gear, unlocking new abilities, and getting more formidable, as the game's structure allows for a near total freedom of approach. Virtually every scenario can be handled in the way you choose (short of peaceful negotiation), limited only by your ability to coordinate your agents and their own equipment and abilities. Every upgrade makes you feel more powerful, but not just in a simple "numbers went up" sense, but in the way that new upgrades unlock new options and ways to break past barriers that limited you before. Unfortunately, like a proper cyberpunk story, Satellite Reign's shiny, polished exterior reveals some grit and ugliness upon close examination. Civilians walk aimlessly to and fro, only there to provide a source of fresh clones for your agents and inconvenient witnesses for their crimes. The open-world structure of the game excises the possibility of truly lasting consequence, with the world, guard patterns, and even destroyed cameras eventually resetting over time. Enemies are a touch too durable as well, their multiple layers of armor, health, and energy shielding limiting certain approaches, and turning most firefights into drawn-out affairs as enemies summon reinforcements faster than you can kill them. Perhaps the most disappointing thing about this otherwise brilliantly-executed game is how hollow its world feels. Despite the gorgeously rendered city visuals and a goodly amount of text to be found by digging through random data terminals, Satellite Reign's city feel less like a world than a cyberpunk-themed playset. You direct your little squad of action figures around and play as you like, but rarely feel lost or immersed in the setting. It would be churlish and greedy to demand storytelling on the level of, say, Deus Ex from the game when it already does everything else so well, but it's saying something when Syndicate still manages to establish a better mood despite being nearly twenty-two years older. At the same time, rough edges like that are a small price to pay when Satellite Reign does Syndicate better than Syndicate ever did.